Do you all remember last year at Hot 97's Summer Jam, morning show host, Peter Rosenberg, made some comments about Nicki Minaj and her music. Nicki was enraged by the comments and pulled out of the show leaving fans severely disappointed. Well after about a year Nicki has put the past behind her and has moved on. Check out the interview below. 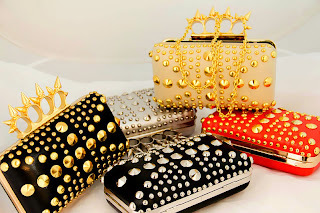 Get a spike gold clutch similar to Nicki's from Ali Express.